Born in Urbino, Genga was an Italian painter, architect, and sculptor, as well as a musician. At a young age he went to Orvieto to study with draughtsman and painter, Luca Signorelli (1445 – 1523). It is in Orvieto that Signorelli produced much of his best work, which was most likely a strong influence on Genga. Though, the painter still broadened his influence, training under Pietro Perugino (1446 – 1524) of the Umbrian School of painting and also befriending a young Raphael (1483 – 1520), who was also from Urbino. Some of his early works were executed in Florence and Siena, then returning to Urbino, but also painting some in Rome. He became well know for his contributions to theatrical works, painting scenes for plays. He was praised for his work in decorations for ruling class patrons, such as Pandolfo Petrucci (1452 – 1512), ruler of Siena, Guidobaldo da Montefeltro (1472 – 1508), Duke of Urbino, as well as his nephew and successor, Francesco Maria I della Rovere (1490 – 1538). Rovere valued Genga greatly and when expelled by Pope Leo X, he took Genga to Cesena and Mantua, from where he also traveled to Pesaro. The Duke was eventually permitted back into Urbino, where he made Genga an official architect and decorator of the city. Genga’s best know altarpiece was painted in Cesena for the Church of San Agostino, his God the Father, the Virgin and Four Fathers of the Church. 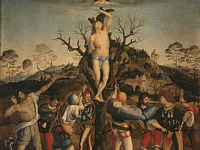 His other well known paintings are now in Florence, such as Martyrdom of Saint Sebastian in the Uffizi Gallery and Holy Family in the Pitti Palace. He designed the San Giovanni Battista Church in Pesaro, the Bishops Palace in Senigallia and a façade for the Cathedral in Mantua. Genga sculpted some and also made models in wax, clay and terra-cotta. He also enhanced his musicianship by designing instruments.